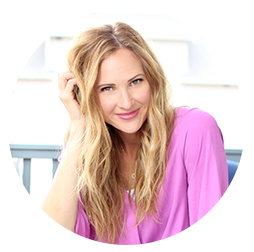 I call my laundry the room, "my laundry closet." It's small. I'm not wild about it. 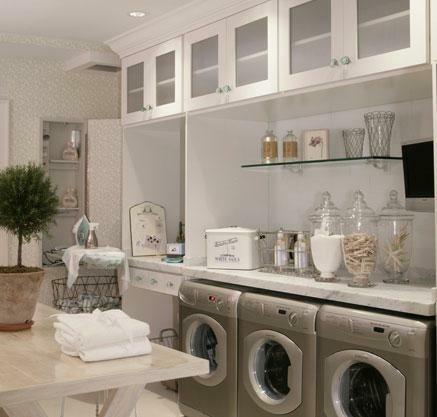 My dear husband has an idea that entails us turning our storage room into a laundry room. We've even had a plumber come over and give us a bid. 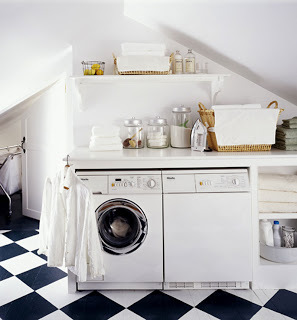 We would turn our now laundry room into a mud room and move the "laundry closet" downstairs into a spacious room. Sounds dreamy. But also sounds like a whole lot of work because don't think for a minute that his plans entail hiring a contractor... unless you consider me a contractor. 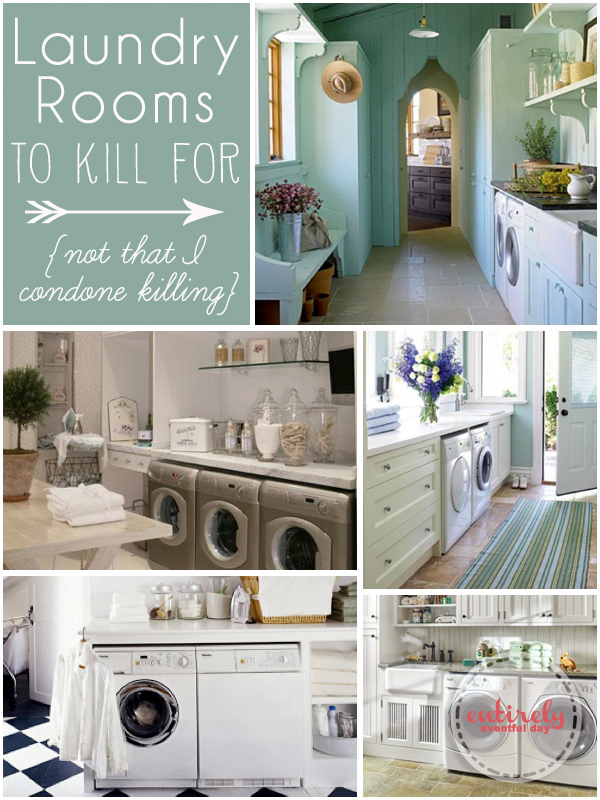 So, just incase this crazy idea actually happens, I started looking at dreamy laundry rooms. I found some that are so dreamy that I just had to share. I am loving this sink. 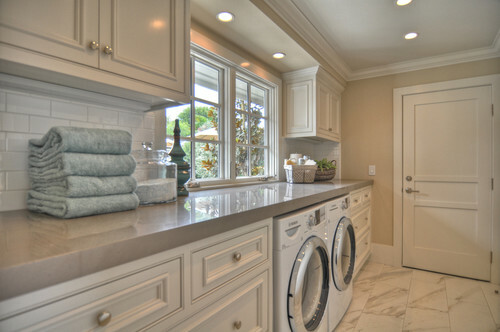 I NEED a sink in my laundry room. I am also super loving the clothes line strung across the back splash. Now that seems a little more realistic. I am loving all the details in these cupboards. I'm not a fan of the tile. But I am super digging the slatted cupboards under the sink. Black and white tile is my friend. I love you, black and white tile. 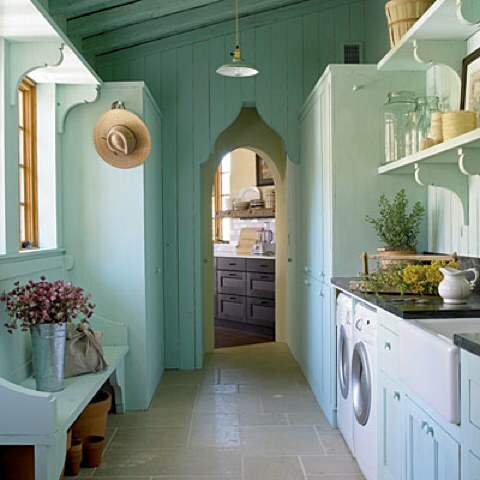 My laundry room would never be clean enough to paint white. Loving this wallpaper. I love the vertical lines paired with more vertical lines of the wainscoting. Again, not loving the tile. Just picture this room with black and white tile. 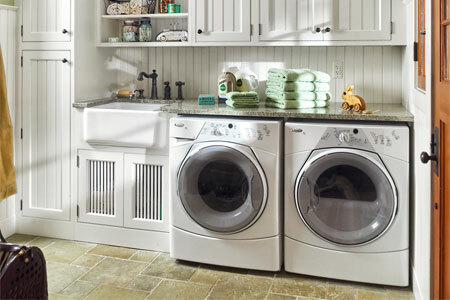 Um, how many washing machines do these people need? I really love the table in the middle of the room. I totally need a folding table... especially if it's as pretty as this one. Oh pretty. I love the counter top over the washer and dryer. I also love those big drawers! This is so not the style of my home. But come on! This room has so much character. It makes me want to own a old home in Santa Fe. Love.